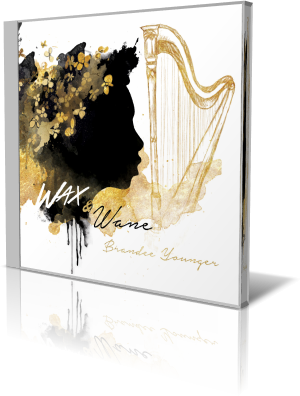 Continuing her tributes to the sounds created by icons Dorothy Ashby and Alice Coltrane, harpist Brandee Younger makes her own mark in the jazz world with Wax & Wane (2016). Younger is accompanied by Anne Drummond, concert and alto flutes; Chelsea Baratz, tenor sax; Mark Whitfield, guitar; Dezron Douglas, electric bass; and Dana Hawkins, drums and percussion. “Soul Vibrations” has a 1970s, disco/funk vibe, influenced mostly by the rhythm guitar effects. However, the song takes on more of a classical feel with the harp and flute melody. After a few passes on the main theme, Younger stretches out for a moment. The music reverts to the theme. Then on the fade, Younger and Drummond step back and let the rhythm section ride it out. The second track is a remake of Younger’s “Essence of Ruby.” The arrangement is mostly faithful to the original, but this rendition has a funkier, jazzier mood. A highlight is Drummond’s solo in the closing sequence. The instrument flits about like a hummingbird in a garden. “Wax and Wane” is another remake. Like “Essence of Ruby,” it appeared on Younger’s previous release, Live at the Breeding Ground. It’s a lively, upbeat piece. Douglas and Hawkins enjoy a background jam, whether carrying the rhythm or providing a backdrop for the others. Drummond and Baratz team up for the melody, while Younger floats in the background. Then, they each take turns in solo while the bass, drums and guitar continue their respective grooves. With Wax and Wane, she is doing exactly that.